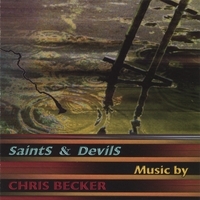 I’m enjoying the delicious cool pool water as I listen to a CD by Chris Becker, “Saints and Devils.” The music uses nat sound collected over the years, Louisianna musicians, archival data and layers them, arranges them beautifully. It has danceable rhythms, beautiful soulful pieces, jazzy songs. The music is complex, energizing, just really beautiful… and addictive to listen to. It reminds me of Olivier Messiaen’s beautiful compositions, especially those where he attempted to mimic, on the piano, the trilling of birds. Chris Becker doesn’t mimic but actually records nat sounds (his dog barking! bells tolling, candid conversations) and musicalizes them. The CD has 10 tracks. It’s a symphonic experience. Go here to listen to some of the tracks and also to buy the CD. I’ll write more after the holidays.